In this posting I will look at Rignot et al 2011 and compare with the University of Colorado “official” level figures. Rignot et al 2011 estimate that over an 18 year period the acceleration in polar ice melt contribution around 1.8mm extra to annual sea level rise that either stayed constant at 3.2mm, or showed a slight decline. Examination of the Rignot figures suggests this result is a bit too neat. Although that acceleration in ice melt are not reflected in average long-term rise, large short-term variations ice-melt in the rate of ice melt do show up in swings in the rate of sea level rise two or three years later. In fact using an 11 month moving average sea level rise, the fit on some of those changes in sea levels are almost a mirror image of that rise. The mirrored similarities between the graphs would be improved by removing the acceleration trend in the ice-melt. When I measure the magnitude of the swings in the sea levels they are six to eight times greater than the expected 1mm rise from 365 billion tonnes of water. Considering possible errors makes the problem worse and would reduce the similarities between the two graphs. This is where I need people to critically review the figures. Point 1 I believe is beyond doubt. Points 2 and 3 are easy to replicate if you have something like Excel 2010 where you can ghost one graph over another. But on point 4 I have been scratching my head over for a couple of days now, and cannot see any way that will correct the figures in the right direction. Rignot et al 2011 et al says the following. Ice sheet mass balance estimates have improved substantially in recent years using a variety of techniques, over different time periods, and at various levels of spatial detail. Considerable disparity remains between these estimates due to the inherent uncertainties of each method, the lack of detailed comparison between independent estimates, and the effect of temporal modulations in ice sheet surface mass balance. Here, we present a consistent record of mass balance for the Greenland and Antarctic ice sheets over the past two decades, validated by the comparison of two independent techniques over the last 8 years: one differencing perimeter loss from net accumulation, and one using a dense time series of time variable gravity. We find excellent agreement between the two techniques for absolute mass loss and acceleration of mass loss. In 2006, the Greenland and Antarctic ice sheets experienced a combined mass loss of 475 ± 158 Gt/yr, equivalent to 1.3 ± 0.4 mm/yr sea level rise. Notably, the acceleration in ice sheet loss over the last 18 years was 21.9 ± 1 Gt/yr2 for Greenland and 14.5 ± 2 Gt/yr2 for Antarctica, for a combined total of 36.3 ± 2 Gt/yr2. This acceleration is 3 times larger than for mountain glaciers and ice caps (12 ± 6 Gt/yr2). If this trend continues, ice sheets will be the dominant contributor to sea level rise in the 21st century. In 2006 combined mass loss was 475 billion tonnes, sufficient to raise sea levels 1.3mm. This gives 365 billion tonnes to raise sea levels by 1mm, something that I have verified in other studies. So the paper estimates the sea level rise from Greenland and Antarctic ice sheets mass loss is accelerating by 0.1mm per annum. The authors also claim that from mountain glaciers and ice caps there is a further 0.033mm of acceleration. Multiply that by 18 years means melting ice must be raising sea levels in 2011 by around 2.4mm more than in 1993. We can also backtrack to when the start point of net ice melt by deducting 36.3 from yearly figure. In 1993, the first year of the study, ice melt comes to 3.1 billion tonnes. That is effectively zero. Further, the 2006 ice mass loss has a calculated uncertainty figure at 158 is quite large. To the nearest whole number it is exactly one-third of 475 central ice-mass loss figure. From this we can then calculate the upper and lower uncertainty bands on the contribution to sea level rise in 1993. The upper band is to assume the highest figure for 2006 (+475+158) and the lowest acceleration (+36.3-2). The lower band is to assume the lowest figure for 2006 (+475-158) and the highest acceleration (+36.3+2). I have put the results in giga tonnes, and equivalent sea level rise into a couple of tables below. The whole structure of figures seems somewhat contrived. However, it does not mean that the figures are outside of the bounds of what could be actually happening. 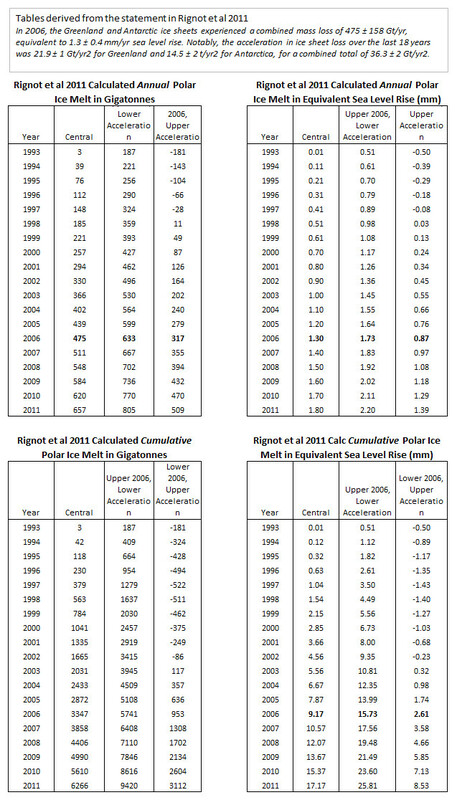 To assess that we must look to the seasonally adjusted sea level rise figures from the University of Colorado. At this stage, the point to note is the trend line. Since the first satellite data in 1993, sea levels have been rising at about 3.2 mm per year. This I have plotted against the modelled contribution from Rignot. If you add in the contribution from mountain glaciers and ice caps, in 18 years ice melt is alleged to have increased from 0% to 75% of the sea level rise trend in that period. That does not stack up. A model that fits so conveniently into the study period and nicely rounds to sea level rise equivalents, shows a trend that is completely out of line with the sea level rise. To probe further, I downloaded the sea level data figures from the University of Colorado. From the website I downloaded the seasonally adjusted figures, as that is what Rignot had used for ice melt. I only use Excel, not the R statistical package like proper statisticians use. So I had to simplify the data. Please bear with me, as my “dumb” analysis still yields some very interesting results in the next section. There are currently 710 lines of data, of which the first is “1992.9595 -5.800“. Each data point has a date and a value. The four places of decimals enable not only the actual day, but even the hour do be identified. As such, if readings are irregularly spaced, it will not bias the analysis, despite there only being about three readings a month, or one every ten days. I split the data into calendar months by first multiplying the decimal by days in the year and doing a lookup from here. I then took the average value per month. I know that February is likely to be under represented, by with 245 months of data, it will not make much of a difference to the general picture. To validate this, I created a simplified version of the cumulative sea level rise graph. It still shows a cumulative rise of 64mm in 20 years. It shows the data points and a 5 month centred moving average. The problem with the graph is that it visually under represents significant short term fluctuations. The rise in the last twelve months is obtained by subtracting figure from 12 months previous from the current month. This generated some enormous fluctuations. I therefore created 11 month and 35 month centred moving averages. Even though smoothed, there are some pretty large fluctuations in the rate of sea level rise, particularly in 1997 to 2000 and after the start of 2010. The 35 month centred is much smoother and it is possible to see a distinct decline from 2001 to 2007 by more than 50%. The Rignot et al 2011 paper posts three nice graphs of estimated ice losses. There are separate ones for Greenland and Antarctica, then a combined graph. It is this graph C that I reproduce below. The annualised rate takes each month reading and multiplies by 12. So change is exaggerated? Rognot has a peak of ice loss around the end of 1994, with an opposite peak of ice gain by a low at the end of 1994. The rate of sea level rise peaked in early 1996, followed by sharp change to small decline in sea levels at the end of 1998. Rognot has a peak of ice loss at the end of 2007, with an opposite low in ice loss in early 2009. The rate of sea level rise peaked in early in late 2009, followed by sharp change to significant decline in sea levels in early 2012. The peaks and troughs are so similar I flipped over the Rignot graph and aligned it up with rate of sea level rise graph. Not only do major turning points correspond, but whole sections as well. The delay in the ice sheet melt is reflected in sea rise about 20 to 36 months after, so it not that exact. Also, a much better fit would be obtained if Rignot had not built in a slope in the graph. It seems the acceleration is anomalous. I have uploaded a file here that contains the images. In Excel try moving the upper image over the lower one, without releasing. I have also included another graph with a centred 13 month moving average. It obtains similar results. It seems that in Rignot et al polar ice melt model (modified for slope) would appear to be an excellent short-run predictive model of the rate sea level rise. There is a slight snag with my numbers. Before doing the above comparison, I looked at various movements between high and low points. I have had to estimate the sea ice changes and dates of changes from the graph. In light blue is the number of gigatonnes of ice/water that is apparently needed to raise see levels by 1mm. The figure in deeper blue is how many times more effective Rignot ice melt appears to be in raising sea levels. I cannot see where I have made an error in this table. Or, at least, everything I can think of makes the problem worse. Here are some possibilities. Annualised data on ice-melt. Each monthly figure is multiplied by twelve. But smoothing would not only make the movements less of a fit between graphs but would exaggerate the problem. Moving average figure for sea level rise. But de-smoothing would not only make the movements less of a fit between graphs but would exaggerate the problem. Further, I would expect a lagged response to smudge the sharpness of the initial impulse, not make it more acute. Please look at the figures carefully, as there is bound to be an issue. After all, one (slightly) manic beancounter is more likely to be wrong that four leading experts in their field. NB. I have comment moderation set for anyone who has not previously commented. If you would like to contact, but do not wish publication, please use the comments, making this clear. I will respect any non-threatening request.